However exercise or movement as I think is better called, has such negative press in the CFS/ME Communities, and to be honest quite rightfully so in a lot of instances, for example when people are put on non personalised formal GET programs, where the ‘professional’ put more emphasis on sticking to the program than listen to the bodies of their clients/ patients, but instead we should try to add movement into our lives that listens to our own body, a good way is to do stretches. This perception I do not think is helped by the news coverage at the moment about how it is our ‘fear of exercise’ that causes us not to recover, or so the news stories have portrayed it (Link). Making it seem like because we are not doing ‘exercise’ we are lazy and dont want to get better. This is not what I am saying AT ALL! In my previous post Redefining what exercise/movement is for CFS/ME (Link) I talked about how we need re think what we think of as ‘exercise’ when suffering from one of these horrible illnesses. If you are bed bound and do not move at all, without implementing any movement in your life how do you expect to be able gain more functionality in your life, for example you need strength to stand up, walk down stairs or even to go out for coffee with a friend. Without any movement your muscles will de condition making it harder to do thinks, and you will be in more pain through lactic acid build up. I went through some stretches in my one to one (Link)but in the TiP Course we went through various stretches in great detail and were encouraged to do them in the group. The vast majority of these stretches can be done sitting so would be great as a starting point to introducing movement into your life. 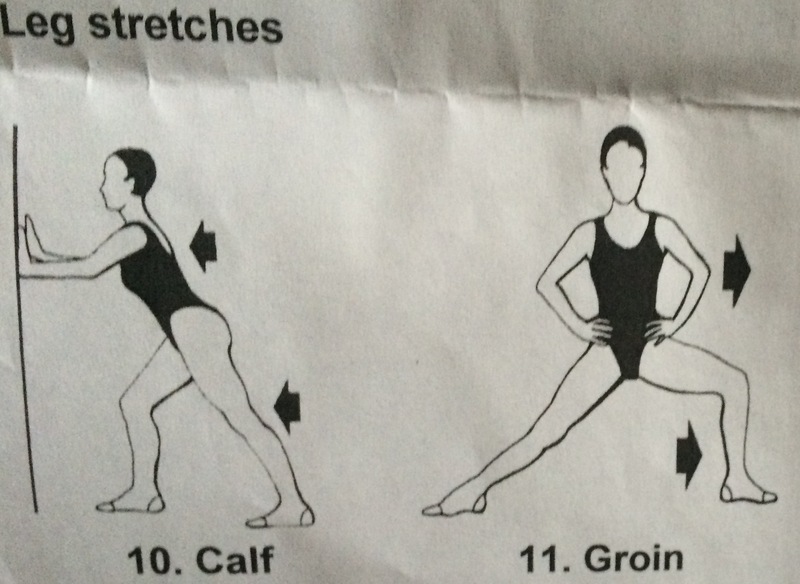 Here are 11 stretches which are great to get you started with, 8 of which can be done sat down. These stretches are so simple and easy, and can be done ANYWHERE! From your: bed, car, desk at work, social events the list is endless! Try to sit up straight (or standing), with your shoulders back and relax then tilt your head forward, hold for 5 seconds and slowly bring your head back up right. Sitting or standing straight, relax and then turn your head as far as it will go to the left, hold for 5 sec then slowly bring back to the centre before doing the same for the right hand side. Sitting or standing straight, relax and then tilt your head towards your shoulder, as if you were trying to touch your ear on your shoulder (not that I can ever get it that far! ), start with one side then slowly after 5 secs bring your head up right before repeating on the other side. nb: make sure you are not unconsciously (or consciously lifting your shoulder to meet your ear rather than the other way round. I think it is worth doing the neck ones in front of a mirror for the first couple of times if possible. This one can be done either sat down or stood up with you legs apart. I prefer doing it seated to be honest! So sit with your feat on the floor and relax where possible your upper body! Then turn from the waist to the left and hold for 5sec before returning to the centre and then repeating for the right. It really doesn’t matter what you do with your arms you just want them to be out the way really, so feel free to either hold them loosely at your waist and let them slide with you, or held out in front of you almost in a loose arms crossed. A lot of these pictures make these stretches look really unachievable for many of us this one being one of the worse, but it couldn’t be further from the truth. Ok so start standing up. with your legs about a shoulders width apart where possible, then put your hands down by your sides. Looking forward then bending from your mid section/ waist area slowly move your arm as far down your left leg as possible, all that happens with your right arm is that it will slide up your side slightly, hold for 5sec then slowly come back to being up right then repeat with the right hand side. You really do not have to lift your other arm above your head like in the picture, this can often make some of us including myself pretty dizzy, if you feel that is something you can do without having negaive repercussions then great but don’t feel you have to. This has to be one of the most satisfying stretches for me and I can rarely do it without my back having a satisfying crack! Standing with your legs parted like with the side bend, put your hands on the small of your back and then from your mid section lean back as far as you can with your legs still firmly on the ground, hold for 5 secs before coming back to the centre. nb: before you get used to this one it might be worth going it with either a sofa or bed behind you to catch you if you get a bit unsteady. Either seated or standing bring your left arm across your chest, either keeping your arm straight( but not locking your elbow) or wrapping it over your right shoulder like in the picture, and using your right hand apply a little bit of presure either just above or below the elbow, what ever is more comfortable, just not directly on the elbow. Hold for 5 sec then repeat with the other arm. This is another one where the picture goes a bit OTT! Well for my level of flexiblity any way! If you are not made of playdough like the diagram then all this one involves to simply try to slide your left arm,with the back of your hand on your back as far is it will go; which if you are like me isn’t very far and hold for 5 sec before repeating with the right arm. Or as I like to call it the back scratcher! This one is pretty much exactly how the picture illustrates, take your left arm stick it up in the air then slide it down your neck/ back (have a lil stratch if you so fancy!) then with your right hand apply a little pressure just above your left elbow. 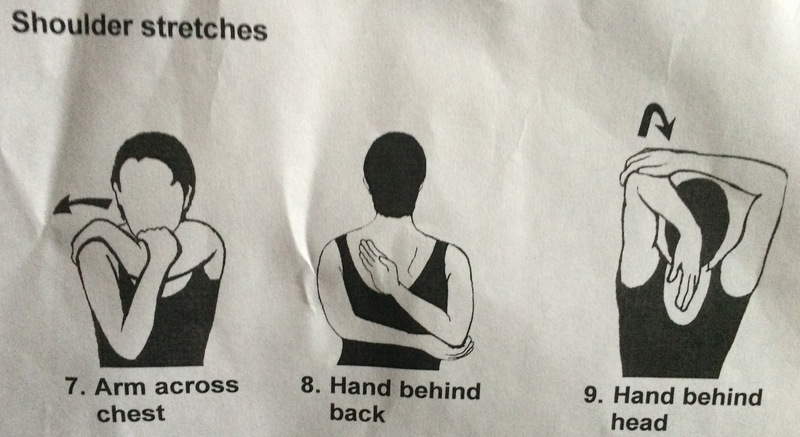 Hold for 5 sec put both arms down before repeating with the other arm. Standing place your left foot in front, and right foot behind. Gently bend your left knee and lower yourself a little, whilst keeping your right leg as straight as possible. Hold for 5 sec before standing up straight and repeating with the other leg. For stability it is worth holding onto the back of a chair or something similar. Whilst this one is also one that you do standing I find myself now naturally doing it a lot of the time in my daily life, and by that comment I hope you have realised you can do this one without looking anything like the picture. To start with simply stand relaxed with your legs about a shoulder length apart, and simply rock from one side to another keeping your feet firmly planted on the floor. If you want to challenge yourself a bit more you can then take one leg out like in the picture and lean on the side for a deeper stretch hold come back to the centre then repeat with the other side. I started for instance with one rep of the neck and trunk stretches in the evening, then build up to one rep in the AM and evening. Now I try to do one rep of all of the 11 stretches at least twice a day. Not only does it help get me moving but it is a great thing to do if you are stressed or need to take your mind off of something. I’ve been doing most of these for a couple of years. At some point – 6 months or a year – I realized I finally have some core muscles. The improvement in my general posture improved my energy and stamina. Standing straighter also improved my appearance. People thought I’d lost some excess weight. I hadn’t, but standing straight made it look as if I had.